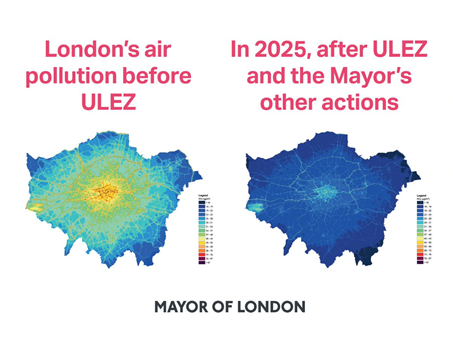 The central London Ultra Low Emissions Zone (ULEZ) begins on 8 April – with a daily £12.50 charge for the most polluting vehicles, 24/7 in the central London Congestion Charge Zone. The statement says ULEZ applies especially to those with petrol cars over 13 years old, diesel cars purchased before 2015 and old lorries and motorbikes. With four weeks to go, check if your vehicle is affected. “We’re making bold changes to improve the air for millions of Londoners: cleaning up buses and taxis, giving schools money for schemes to protect them from pollution, and helping microbusinesses, charities and low-income Londoners change their vehicles before ULEZ. “These steps are bringing positive changes, but there’s more to do. Almost half of the pollution we breathe is from road transport: we simply can’t reduce toxic air pollution without tackling the most polluting vehicles. “London’s toxic air is a public health emergency. Pollution is shortening lives, it’s linked to asthma, strokes, heart disease and dementia. It costs the NHS £3.7 billion each year and affects children at more than 440 schools who are breathing air that exceeds safe legal pollution levels – this can’t continue. P.S Learn more about what we’re doing to improve London’s air.